Something about spring makes me (Kirstin) restless for the tropics. You’d think winter, with its grey days and snow, would drive me to think of warm sand and sun, but I usually hibernate right through the worst of it. Spring rolls around, with just a hint of better weather, and I suddenly wake up only to discover I’m still living in a semi-arid, land-locked state in the center of a continent. It surprises me every year. 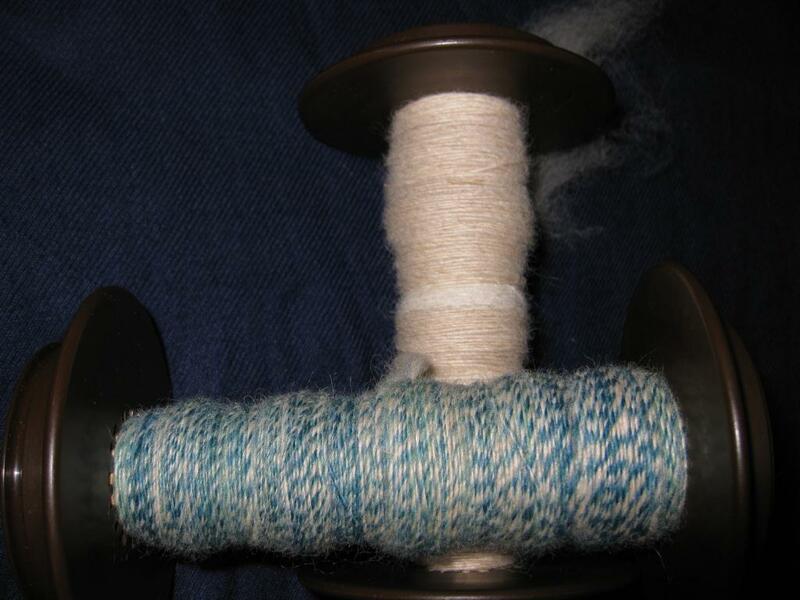 Last night, I pulled out this blue roving I’d been saving for an inspired moment, and marled it with Tuscany’s roving. I also spun a single with just Tuscany’s cream colored roving. The combination was meant to evoke soft, fine-grained sand and the multiplicity of blues in the tropical oceans. I haven’t had a chance to ply them together yet; I was moving slowly last night. A quick preview shows that I certainly wasn’t being very consistent with the weight of the yarn. Strangely, I don’t much care, perhaps because hard edges and straight lines are the exception in natural landscapes. I’ve somewhat wistfully named the yarn “Seascape”. This entry was posted in fiber art and tagged alpaca fiber, alpaca yarn, hand spinning, handspinning, handspun, marled yarn, roving, spinning, yarn. Bookmark the permalink. Dearest, What beautiful yarn you’ve just spun, and what beautiful words you weave together to create an exceptional tapestry for our Friday blog post. Love always, Momma. Thanks Momma! Sometimes it just flows. Other times, it’s like trying to nail jello to a tree. It’s lovely, just as it is and I adore the colours! Thanks! Some days I just don’t feel…I don’t know, focused enough maybe, to produce even yarn. 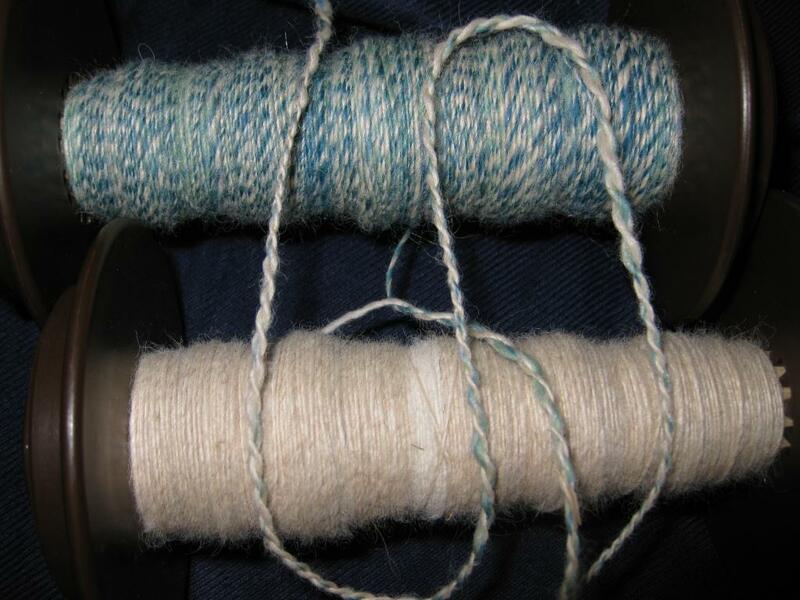 Today I plied up the last of the alpaca/silk mix. I got the hang of it eventually and I love the feel of it. I had a little left over so I mixed it with the remains of the Targhee wool and the result is very pretty. I’ll post on it soon. What lovely yarn – I can just hear the surf breaking on that beach…………………. Sounds like you have a severe case of SPRING fever – it serves you well!! It does seem to be making me more creative than usual, but I could wish for a little more peace of mind and a little less restlessness. And thanks, I like, uneven and all.